In recent years, swooper flags have been one of the more popular stationary outdoor advertising options. Calling them flags is a little deceiving, as they are basically a combination of flag and banner. Large, flashy, and inexpensive, they are a great option for marking your dealerships location, grabbing attention, or promoting offers. One of the best qualities of swooper flags, beyond the reasonable price, is that several dealer supply retailers offer customizable options. By personalizing swooper flags to meet your own particular needs can be a very cost effective solution. 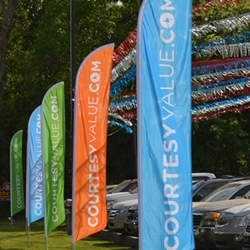 If you are considering a swooper flag for your dealership, be sure to contact your local dealer supply retailer to see what customization options they offer. We here at MyDealerSupply, for instance, offer customization as well as a designer to assist you in creating the perfect advertising solution to fit your exact specifications.